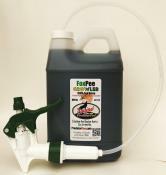 PredatorPee Fox Urine bunny repellent – Foxes are very efficient killing machines. They are quick, smart and lethal. Foxes prey on rabbits, hare, chipmunks and squirrels. The PredatorPee Fox Urine for rabbits is a simple concept - create a "pee-rimeter" around your yard, garden etc in much the same way as a Fox marks its territory in the wild. The Fox Urine "pee-rimeter" creates a ring of fear that Fox prey will make every effort to avoid. You have seen the damage that these critters can cause. Now you can get a rabbit and hare repellent without chemicals with all-natural, pesticide-free Fox Urine in a convenient 12 ounce squeeze bottle. Browse our natural rabbit repellents below. ALL NEW! 100% Pure PredatorPee® Fox Urine - 64 oz Jug. Use to refill our 12 oz squirt bottle, 16 oz spray bottle, or simply attach the included adjustable sprayer and squirt right out of the jug! Save $20 over single bottle prices! ALL NEW! 100% Pure PredatorPee® Fox Urine - 64 oz Refill Jug together with a 16 oz spray bottle and 6 packages of Scent Tags to set up a "pee-rimeter." This combo will treat approximately 600 linear feet! Save big over single unit prices! Original PredatorPee® Fox Urine Yard Cover Shakin' Flake Granules – 16 oz jar. Each Jar covers about 200 sq ft – Perfect for burrowing and digging pests. Great for lawns, flower beds, gardens, container gardens, etc. - Big Savings when you buy multiples! Each Prices ShownEach Prices Shown - Save $6 When You Buy 3! Save $24 or More When You Buy 6 or More! FREE SHIPPING to USA and CANADA! 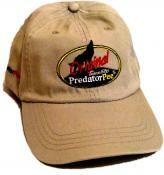 An 8 pack of vent-top canisters that are “pee-loaded” with PredatorPee® Fox Urine. Designed for indoor use in attics, basements, sheds, garages, under decks, barns etc. Also perfect to stop wire & upholstery chewing in boats, rv's, cars, trucks, atv's, snowmobiles, motorcycles etc. Just remove the lids and place for a month or more of protection - Big Savings when you buy multiples! Includes five 64 oz growlers of Predator Pee Fox Urine equal to twenty 16 oz bottles worth, a reusable 1 gallon heavy duty sprayer, and fourteen packages of scent tags. Protects four acres or 1600 feet! Save $250 over single item prices! 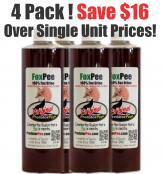 BUDGET SAVER 4 PK Fox Urine - Save $16! Just in time for the Spring season - Save $16 over single bottle prices when you buy this 4-pack of Fox Urine 12 ounce bottles. Free Priority Mail Shipping, too! 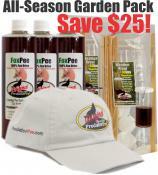 Fox Pee All Season ScentTag Garden Pack – Protect your garden for up to 5 months against rabbits and skunks with our Fox Urine All Season Garden Pack. It contains 3 – 12oz bottles of fox Pee and 2 ten packs of ScentTags and a Free PredatorPee® Hat! Total Retail Value: $114 – Your Cost: $89! 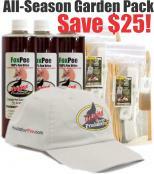 Fox Pee All Season Weather-proof Dispenser Garden Pack - Save $25! Fox Pee All Season Weather-proof Dispenser Garden Pack – Protect your garden for up to 5 months against rabbits and skunks with our Fox Urine All Season Garden Pack. It contains 3 – 12oz bottles of Coyote Pee and 2 ten packs of 33Day Weather-proof Dispensers that disperse the scent and protect it from wind, rain and water and a Free PredatorPee® Hat! Total Retail Value: $128 – Your Cost: $103!